SmartHook is excellent for the fast, secure hanging and security of paintings. 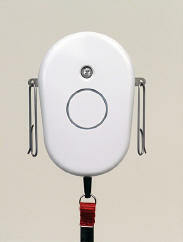 It combines a strong hanging system (max 20kg) and alarm in one. Screw SmartHook into the wall, hang the painting as for a normal picture hook, pull the tag to activate the painting alarm and the painting security system is armed. (Optional clips provide extra security). Inexpensive, discrete, flexible, easy in use, reliable picture alarm. An extra addition to the security of auction houses, hotels, restaurants and art (for sale) in . Simple to deactivate (with the tag) and then take off the painting to change batteries (annually) or sell the artwork. Loud siren continues until deactivated. Museum exhibitions, touring exhibitions, trust houses and homes, art galleries, restaurants, hotels anywhere that art is hung with a conventional picture wire. This is not a vibration alarm and will not accidentally activate. Many exhibitions run for 2 or 3 months and then travel to another venue. SmartHook can be the solution to your security and hanging needs. The system travels with the exhibition and is used to mount and alarm the art in one. Simple comprehensive instructions mean that gallery assistants find this easy and comfortable to use. The security of art in the lobby is always a problem with little control over who enters and exits the hotel. SmartHook offers a pragmatic solution being able to simply hang the art and add strengtheners to deter any opportunist and a real determined attack will result in the alarm sounding. Although rooms are often roped off and there are assistants or volunteers to watch for theft attempts, often pictures are hung in corridors or in unprotected areas of a room. SmartHook is for these occasions. Assessed and approved by the National Trust's Security Team, SmartHook is a simple to use addition to security arrangements. Function: Art hanging device (use in conjunction with other picture hooks for heavy paintings) and Alarm activated if attempt made to grab and lift painting. Responds to change in weight. Loudness: 115 dB at 30cm, one year warranty. Installation: Determine the wall type. If the walls are hollow gypsum or plaster or masonry use appropriate rawplugs, for wooden walls screw in direct. The screws should be 2" (never use a nail). Determine the weight of the Art. If it is more than 10kg refer to hints and tips below (item 3) for other hanging options. 1. Insert the tag and pull cord. Insert the batteries. Pull the cord to check it works (wear ear protection when you do this). Reinsert the cord. 2. After drilling the hole and inserting rawplug if appropriate, insert the screw through the SmartHook and tighten by hand. Ensure it is vertical. 4. Once the art is balanced and level, gently pull the cord. The SmartHook is now active. 5. Pull the bottom of the frame out (keep tension on the hanger) and re-insert the pull cord. Remove the capture clips and lift the picture (towards the back and up). 1. Once activated put the pull tag somewhere safe but where you will find it.